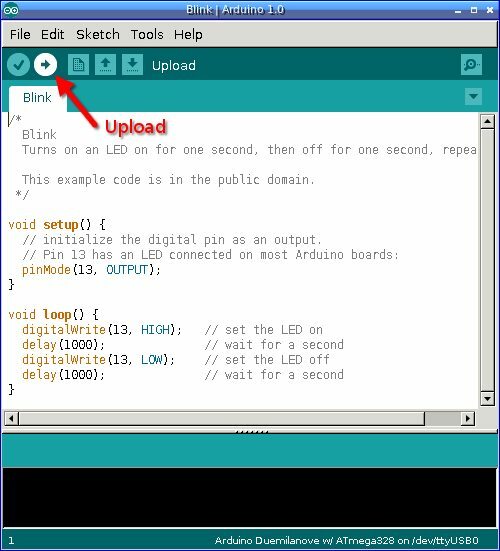 Plug your Arduino in to the computer's USB port. A power light should come on. Wire up your LED as shown at right. 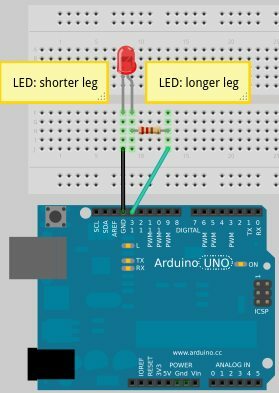 LEDs only pass current in one direction: the longer leg has to connect to the positive + side of the circuit, the shorter leg to the ground (negative) side. the longer leg going via a resistor to pin 13. Whenever you use an LED, you always want to include a resistor. Otherwise, you'll overload the LED and it will blow out. It doesn't matter whether you put the resistor before the LED or after it, on the + side or on the ground side, as long as it's there. The sketch should upload to the Arduino, and you should see some lights on the Arduino flash. Then your LED should start blinking. setup is run once, when the program first starts running. loop is run over and over, forever. digitalWrite writes to one of the Arduino's pins. delay waits that many milliseconds (thousandths of a second) before continuing the program. Now try to make it blink faster or slower -- how would you do that? How about making one LED be ON while the other is OFF? If you get something that works, you can save it, using File->Save as. Give it a name describing what it does, like 2led or one-on-one-off. Any time you change a sketch to make it do something new, you can save it to a new name -- that way you can go back to it later. Too easy? Try a problem that's a little harder: make your two LEDs blink at different rates. For instance, make the green one blink twice as fast as the red one.